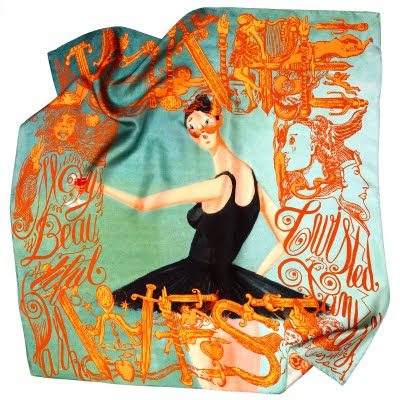 The "ballerina" scarf is one of five inspired by the musical fantasies of Kanye West. Photos courtesy of M/M (Paris). FROM Kanye West’s flights of fancy to your arm. Or neck or waist. Or both. Or wherever you please, really ... The "ballerina" and possibly four other scarves. "Ballerina" has a teal background. At its center is a woman standing in profile, except her head, which faces the viewer. She wears a black tutu and a surprised expression. 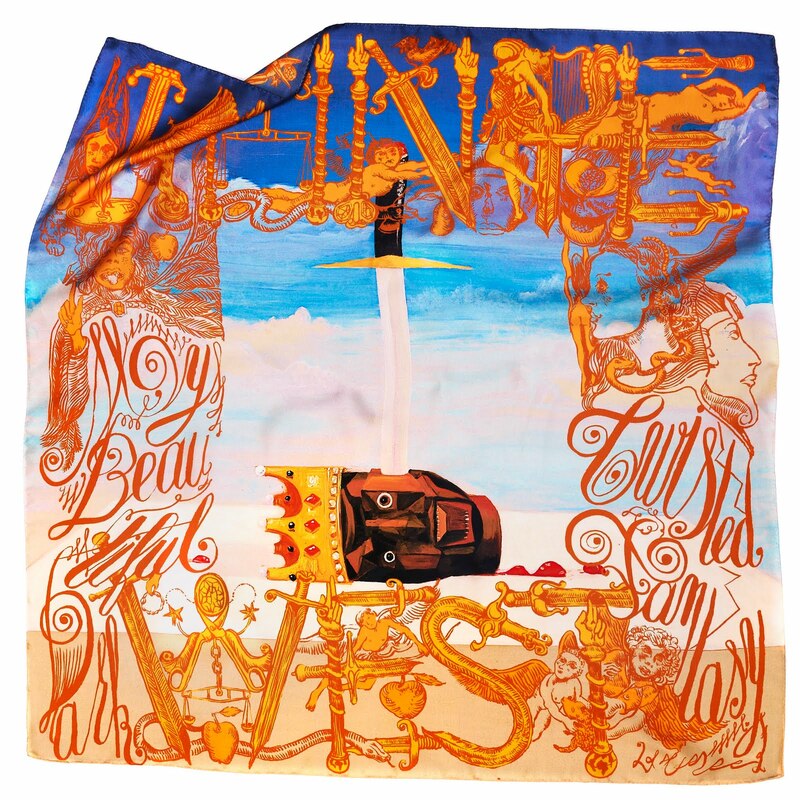 This main image, as are all on each of the five scarves, is surrounded by drawings, lettering (including some that spell out KW’s name) and other elements in a rich gold. Is the "power" scarf a cautionary tale or a call for empowerment? Before they were scarves the fantasies, painted by George Condo, existed as packaging, courtesy of M/M (Paris) for KW’s acclaimed “My Beautiful Dark Twisted Fantasy” album. As these things often go, KW and M/M (Paris) saw a way to repurpose the packaging – as scarves – thus creating another commercial platform. “Ballerina” is available for purchase at http://www.mmparis.com/. Yet, if a body must have “power,” for instance, he could write to shop@mmparis.com to have his name placed on a waitlist in case more become available. Framed by the gold hand-drawn lettering and against a backdrop of a partly cloudy sky, the “power” scarf features a king’s severed head with the crown still attached. The head is lying in what appears to be sand and is turned on one ear with a sword embedded through it. Visit http://www.mmparis.com/ to learn more about the scarves. Hey, thanks for the compliment. It takes a village. Keep reading and let us know when we start slipping.